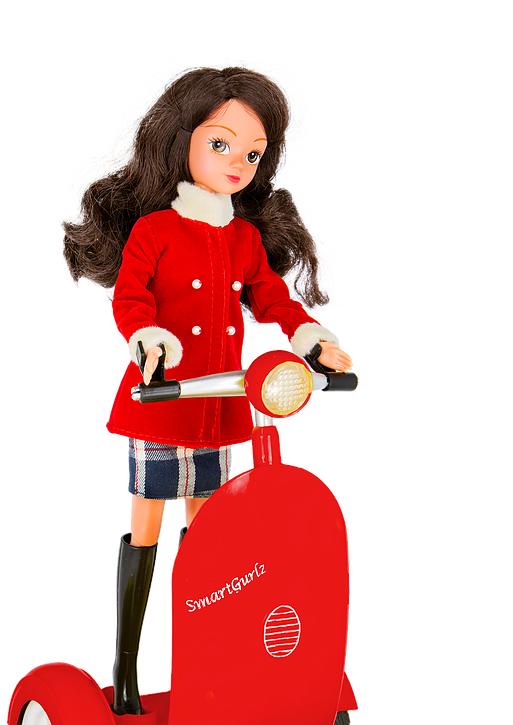 The SmartGurlz Coding Doll is the STEM educating doll scooter for kids ages 6+. Teaches girls to code by providing lively coding assignments, stories and missions that inspires the young girls of today to be the leaders and creators of tomorrow. SmartGurlz™ is a brand new line of friendly coding robots and action dolls that engages girls ages 6 and up in Science, Technology, Engineering and Math (STEM). SmartGurlz™ opens a world of fun and at the same time inspiring interest in coding and the technological world with self-balancing robots. Connected via smartphone or tablet this coding robot plunges girls into the heart of the action and allows for hours and hours play fun and learning. It inspire girls to be tomorrow’s creators and leaders by teaching them to code their dolls and Siggy robots in endless fun combinations. This Siggy robot and dark haired Maria doll kit are drop-dead gorgeous and ULTRA RARE, as we only produced a limited batch and stock is very low. • Connect via smart phone and tablet with app SugarCoded™. • Can dance, do tricks, drive in circles and navigate over surfaces inside and out. • Fit Barbie and most other 11' inch dolls. • Is able to carry up to 6 ounces or 180 grams (an iPhone or a Mcdonald's quarter pounder). • Flashing lights in 2 colors! A step-by-step tutorial that teaches you each coding block. The blocks are similar to Scratch (MIT learning lab) or Google Blockly and are considered the world’s best way to teach coding to kids. Freeplay is an intelligent joystick that allows you save your fun moves, replay and even use pre-programmed dances to start the right out of the box. 4 game-like missions that include videos of our characters, maps and problem solving linked to the books. For example, one coding mission is to help Maria find hotdogs in Central Park by reading the map and coding the Siggy through the paths. SugarCoded is a sandbox that allows you to create and save all kinds of coding programs with hundreds of lines of code. A button at the top allows users to see how their blocks are actually Java Script code. • Free with every purchase, SugarCoded™ is our proprietary app introduces girls to coding, games, lessons, books and learning! 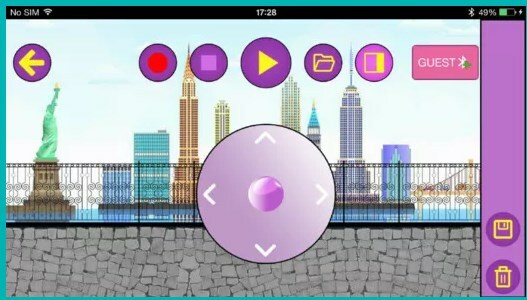 • Learn to code through our drag and drop interface in a game-like, self-directed tutorial starring Smart Gurlz™ characters. • Put your new coding skills to the test driving around solving missions, learn repeat-loops, basic algorithms, and compare with your friends. • Included illustrated e-books that highlight life as a chemist, computer hacker, engineer or artist. A 10-point articulated doll with a luxurious velvet red coat with faux fur and pearl buttons with a classic tartan pencil skirt and knee high boots. Faux suede school bag completes her classic look. ​Her long, wavy brunette hair is perfect for styling. 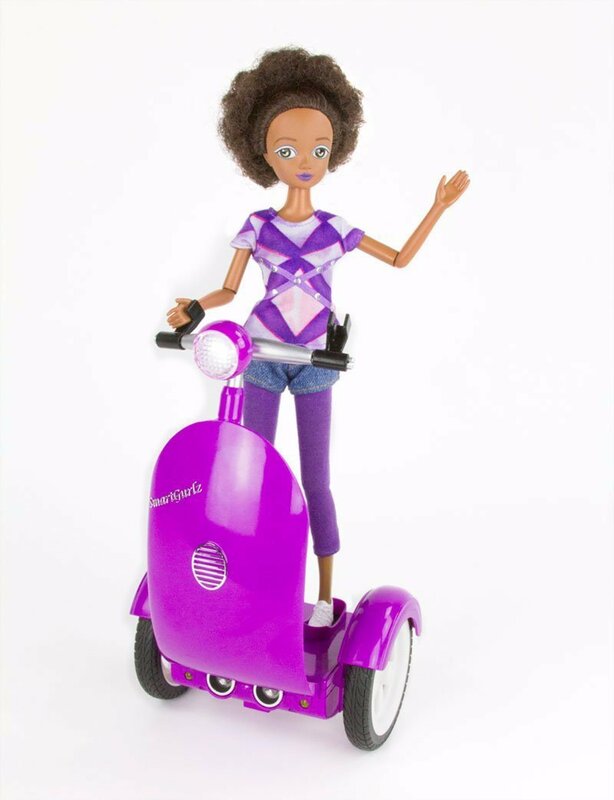 Smart dolls with style seek to make coding more fun for girls "SmartGurlz is a line of scooter-riding dolls you program with a mobile app. The use of fashion and storylines is part of a plan to get more girls into STEM!" Siggy, is a fun app-controlled, self-balancing, inverted pendulum robot that is controlled by the SmartGurlz app - SugarCoded. Please note that Siggy only ‘balances’ when it is ‘carrying’ a SmartGurlz doll or other 11 inch / 28 cm fashion dolls that can be attached to the wrist holders on the handlebar. Play, learn to code, interact and problem solve with Siggy our Bluetooth® Low Energy (BLE) enabled, self-balancing mobile device. Take a few minutes to look through this guide and get the most out of your play with Siggy and begin the fun of SmartGurlz. Note: For easy reading, iPhone®, iPad®, Android phones or tablets are referred to as 'smart device' in this user guide. 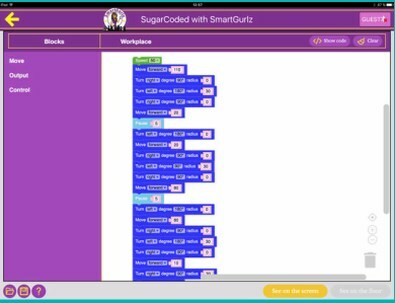 Connect to the App Store or Google Play and download the free SugarCoded by SmartGurlz application, and make sure it opens on your smart device. HOW DO I INSTALL / CHANGE THE BATTERY? A regular 9-volt battery is required provide 3-6 hours of moderate play. However, we recommend that you purchase a rechargeable 7.4 V Lithium Ion or Lithium Polymer battery with a capacity larger than 600 mAh. You can also purchase a re-chargeable SiggyPower® Module with built in charger allows your Siggy to be recharged without the hassle of exchanging the battery. Attach the battery cord to the battery terminals. Screw the door back on. When the battery grows weak, Siggy™ will move slowly and more easily fall down while moving or turning. Also driving range will decrease and a beeping sound may occur. When this occurs, power Off Siggy and replace the battery as described above. HOW DO I CLIP ON DOLL? NOTE: Siggy needs to have a doll or another 6 ounce object to balance and drive. Use the wrist holders to clip in a SmartGurlz doll or other standard 11 inch / 28 cm fashion doll on to the handlebar. Make sure that the feet of the doll are firmly positioned in the designated footrests. HOW TO TURN ON SIGGY? Turn On Siggy with the On/Off switch, located at the bottom of Siggy. Carefully place Siggy upright on its wheels on a smooth surface away from edges and obstacles. When balancing, you should feel traction in its wheels and hear a short beep. Let go of Siggy and it will balance on its own with slight movements, back and forward, in order to keep its balance. After 5-10 sec you will hear 2 short beeps and Siggy is ready for action. my Siggy product says its needs an update. what to do? Firmware updating: Your Siggy is equipped with an Over-The-Air (OTA) firmware update functionality that allows your Siggy to be updated with the latest firmware. Throughout the lifespan of your Siggy both app updates and firmware updates will become available including new features, new missions, new programming blocks, bug fixes etc. A firmware update option will be available when connecting to Siggy whenever a new firmware is released. Firmware updating takes approximately 3 minutes. Black Siggy: If your Siggy turns up as a black Siggy on the "Choose Siggy" screen this can be an indicator that an update has failed. Select the Siggy and press Yes to update. If the problem persists please restart your Siggy and smart device. PLAY TIME: CONNECTING SIGGY TO THE SUGARCODED APP. Make sure Siggy is turned on and balancing on the floor. Open the SugarCoded app and a Siggy in your color will appear solid on the screen. Click your Siggy and a green contour will indicate when your Siggy is connected to the app. In the upper right corner, a green check mark on the Bluetooth symbol, will at all times indicate if your Siggy is successfully connected to the app. You may name your Siggy by pressing the name tag below Siggy. FREE PLAY: Your first try playing with Siggy should be using the Free Play. Use the joystick in the middle of the screen to move Siggy and Jen/Maria around the room. Girls want to have fun and FreePlay allows them to do it in a creative and engaging way. With our advanced joystick, girls can drive on the floor, save their choreography, use our pre-programmed buttons to ask Siggy to perform a figure 8, a “twist and turn” dance, 90 degrees turns, etc. You may save and load recorded drive patterns using the record, save and load buttons. PATH: With Path, girls are introduced to the fundamentals of robotics and coding with just a swipe from a finger! Drawing a route on their smart device, girls send Siggy and Jen/Maria on journeys around the house just with the swipe of their fingers. You may save and load recorded drive paths using the save and load buttons. SUGARCODED: The next step after LEARN is SUGARCODED, the ultimate coding sandbox where everything is left to the imagination! 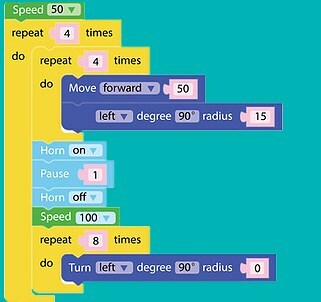 Blocks of code based on Java are easy to drag and drop and lets you code the movement of a dance, a parade or even a game. You may save and load SugarCoded programs using the save and load buttons in the bottom of the screen. MISSIONS: Challenge yourself with SmartGurlz missions! Girls who want to become master coders are given problems to solve that require map reading, critical thinking and perseverance. The missions includes fun videos and a game-like interface. EBOOKS: Our beautifully illustrated e-books provide girls insight into the worlds of our SmartGurlz characters – Jen and Maria. Our wholesome characters give girls dreams and ambition about entering the exciting world of STEM (Science, Technology, Engineering and Math). Make sure that Bluetooth connection on your device is ON. Bluetooth is enabled within the settings menu of your smart-device. After being enabled Siggy should show up within the app. If Siggy does NOT appear in the Bluetooth connection window, check the version requirements listed in the beginning of this user guide. Most likely: Check the battery. At low battery, you may experience decreased driving range which might result in the loss of Bluetooth connection. Less likely: If SugarCoded loses connection to Siggy, the green check mark in upper right corner of the screen has turned red and Siggy is NOT connected. Go to CHOOSE SIGGY screen and re-connect. Even less likely: Close SugarCoded and turn Siggy off and on again. Restart SugarCoded and Siggy should appear. Turn Off / On Bluetooth in the device setting menu. Turn Off / On Siggy, and Siggy should appear. Restart your smart device and start all over. When turning Siggy on make sure to hold Siggy on an even surface from where it self-calibrates within 5-10 seconds. The calibration starts with one beep and finishes with a double beep. Make sure no hair gets tangled between the wheel and body and avoid hair rolling up. HOW DOES smartgurlz siggy COMMUNICATE WITH SMART DEVICES? Smartgurlz Siggy uses BLE (Bluetooth low energy) technology to communicate with newer iOS and Android smart devices. Using your smart device, you can download the SmartGurlz SugarCoded app on the iTunes or Google Play store. Then you can select your Siggy from the app and control your Siggy. There are many features available in our app and we'll be updating the app regularly. Black Siggy? What does this mean? Update: How do I update the product? Turn on your smart device with the SugarCoded app open. Follow instructions on the app. Turn on the Siggy, lay it flat on its side on a flat surface (table or on the floor). Press the button ‘update’ when the SugarCoded app prompts. Once the product beeps twice and the app shows 100 percent completion. You can start to play. Why do I get an error in my app? You may have an older version of the SugarCoded app. Please manually delete the app and download/install our newest version from the App store or Google Play. The Siggy Robot requires a 9 Volt Battery or a Siggy Power battery. Yes, the SugarCoded app can be downloaded in English, French, Spanish, German and Danish. Which KINDLE works with the SugarCoded app?